DISCLOSURE: This post includes a review of the PetSafe® Brand Drinkwell® Outdoor Pet Dog Fountain. PetSafe provided a fountain to review, and one to giveaway, but no other compensation. Any opinions in this post are my own. July is Pet Hydration Month. Can you guess why? You know your dog needs clean water daily. But do you know how much? And do you know the signs if your dog is dehydrated? 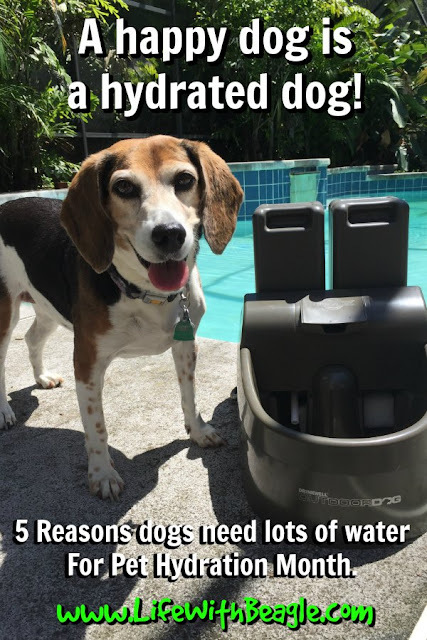 Here are 5 reasons your dog needs to have clean drinking water all day long, and especially in the summer.